They say two’s company… but they don’t know Oscar and Felix. Felix Ungar’s wife has left him, and in his time of desperation, friend and fellow-divorcee Oscar Madison invites him to move in. The pair soon realize they are like oil and water, as Oscar’s carefree and slovenly lifestyle clashes with the compulsion that Felix has towards cleanliness and order. 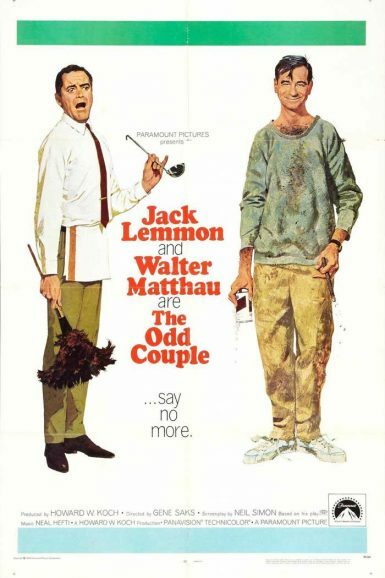 Jack Lemmon and Walter Matthau are The Odd Couple… say no more! Paul is a buttoned-up, clean-cut, professional. Corie is a quirky, independent, free-spirit. On paper they may not work together, but the two are madly in love and recently married. The excitement doesn’t last too long as their 5th-floor hovel, eccentric upstairs neighbor, and nosy mother aren’t exactly what the couple had expected for their housewarming. During a night out, an argument causes the two to question their entire relationship. Can these newlyweds find domestic bliss despite their differences? 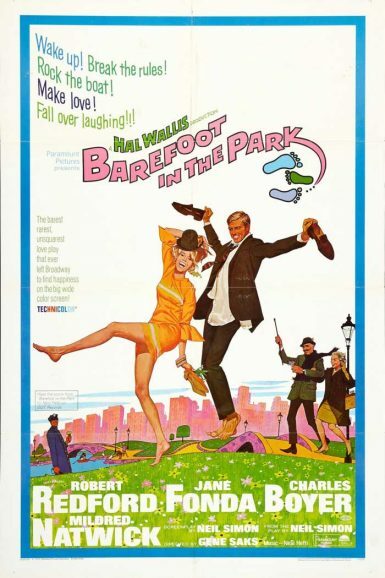 Neil Simon’s Barefoot in the Park stars Jane Fonda as Corie Bratter, with Robert Redford reprising his Broadway role of Paul Bratter, plus an Oscar-nominated supporting performance by Mildred Natwick.